With Spring Break and summer vacations only a few months away, many of you have already started thinking about your travel plans. As someone who travels frequently, I'm always looking for travel-friendly products that make life easier. I'm a carry-on luggage kind of girl as much as I can help it, which means limited liquids. This can make bathroom and makeup supplies tricky. Between facial cleansers, toner, moisturizers, hair care products and the like, that 3 oz airport carry-on rule requires some creative thinking. With that said, I'm excited to have discovered three new travel-friendly products from the Kleenex skincare line. I am officially done with cotton balls and tiny cotton pads now that I've found these larger pads. They're marketed as a 5-in-1 beauty tool and are just as versatile as they claim. The soft, durable texture is fantastic for wet or dry use and the fabric keeps the liquids on the pad without absorbing too much. This is especially great for applying face masks or removing nail polish. Travel tip: Leave your makeup sponges at home and use the pads to apply your foundation. 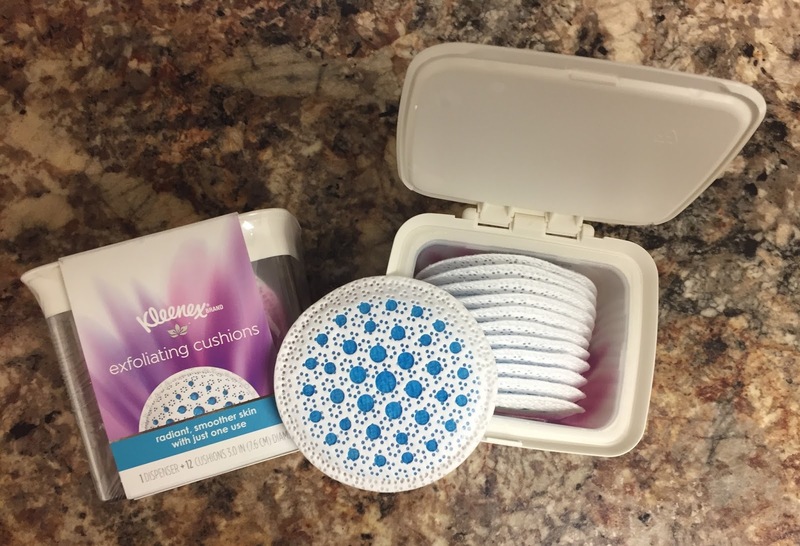 Pair with the Kleenex Exfoliating Pads to remove makeup instead of bringing makeup remover with you. Quite possibly my favorite travel product, these exfoliating cushions replace the need to pack a separate liquid facial cleanser. Toss as many as you like in your travel bag and when you're ready to wash your face, just add water to activate the cleanser! The cushions are dual-sided and multi-layered, so you can choose whether you want to exfoliate deeply or flip it over and wash with the gentler side. Travel tip: No need to bring a bottle of facial cleanser. These are perfect as a ready-made face wash. I also toss them in my purse to freshen up on the plane or at the airport. The travel container that these cleansing wipes come in had to have been designed with travel in mind. It is incredibly easy to toss in my checked luggage or my tote bag to use anytime, anywhere. I've tried other brands of facial wipes in the past, but they dried my skin out like crazy. The Kleenex brand got it right by making these wipes alcohol-free. My skin feels super clean without over-drying and the betaine, aloe and Vitamin E help to keep it hydrated and healthy. I was pleasantly surprised that it removed my makeup so easily as well. Travel tip: If you've got the space for this container, I'd leave the cleansers and toners at home and stick with Kleenex Facial Cleansing Wipes for your trip. I also use them at home regularly and like to keep them in my car for a facial refresher after work. If you're limited on space in your luggage, I'd stick with the exfoliating cushions and soft pads. Order Kleenex facial products online or find them at your local CVS, Target or Walmart. 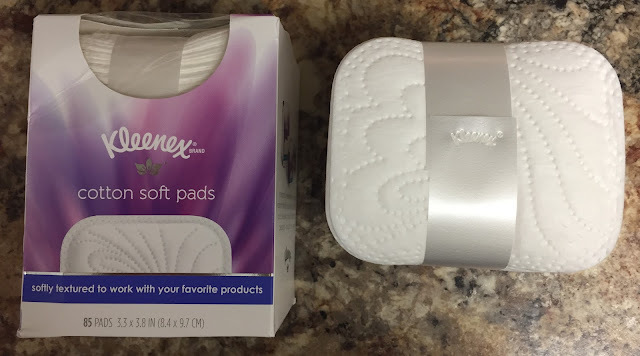 We love the Kleenex Cotton Soft Pads so much that we'd like to give you the chance to try them for yourself! To enter, click on the entry options below. Contest open to U.S. residents only.